POSTED: Tue, 10/10/2017 - 16:00 | POSTED BY: Traci C.
Happy Tuesday! We're back with another edition of our Disney news round-up and today we're talking about the return of the Ferrytale Fireworks Cruise on Seven Seas Lagoon, a new Disney newsletter, and an update on the Halloween night Mickey's Not-So-Scary Halloween Party. 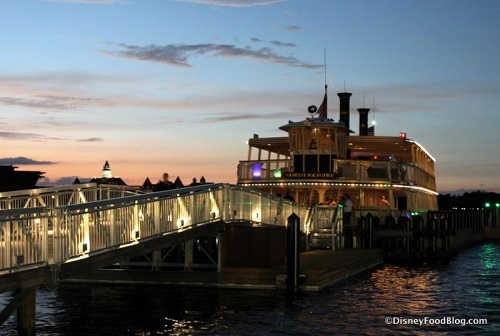 Ferrytale Fireworks: A Sparking Dessert Cruise is returning to Seven Seas Lagoon through January 28. Guests can make reservations for this special cruise now and the price is $99 for adults and $69 for kids ages 3-9. The Disney Parks Blog has launched an updated daily newsletter featuring their top stories each day. The Walt Disney Company was recently honored with the Corporation of the Year award from the Asian Business Association-Los Angeles for its supplier diversity efforts. Mickey's Not-So-Scary Halloween Party on October 31 is sold out. Guests can still make reservations for other nights of the special hard ticket event. Stitch's Great Escape at the Magic Kingdom has been transformed into Stitch's Alien Encounter character meet-and-greet. Hours of operation will vary so check the times schedule at the park. And finally, Disney recently filed a new patent that could be the beginning of a Spider-Man themed attraction. There's no official word yet from Disney about any new attractions fitting the description in the patent. We'd love to hear your thoughts on today's new round-up. Leave a comment and let us know what you're thinking.